I’ve voiced my love for cast iron pans on here before. These things are awesome. And if you don’t have one, well, talk to me when you do. They are great heat conductors and retainers. If you made a dish in a cast-iron pan, you can sit it on the table and that food will stay hot, don’t ya know. They are oven-safe, making them the perfect dishes to take from stove to oven. Did you notice I listed three reasons? Good, that means you’re paying attention. I love my cast iron pan. The trick to them is seasoning them well (you can buy them pre-seasoned now, or you can do it yourself with a low-heated oven and some lard. Google it!) and also to never, ever, ever wash them. Yes, you read that right. No soap. Ever. Hot hot water, some elbow grease and that’s it. Oh, and when you’re done rinsing out your pan with hot water, stick it in the oven at a low heat or on the stove to dry it so it doesn’t rust. What do you use cast iron skillet for? Do whatever the heck you want to do! Yeah, cast iron skillets are awesome. So thankful for mine, which was passed down from my old boss, so it’s seasoned real goood. Do you have a cast iron skillet? What do you use yours for? 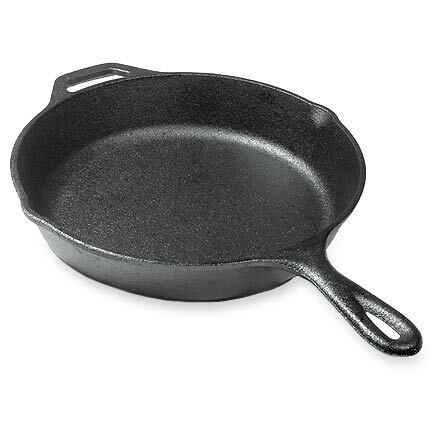 it’s amazing all the deffirent opinions on seasoning and treating cast iron. I usually season mine in my BBQ grill just because of the smoke it can create.I also usually just put a bit of water in there, scrub it just enough to get the stuff loose, then rinse it out good, set it over low heat and rub with oil to season again but I say whatever method works for you is the method you should use cast iron rocks..love to use the dutch ovens when we go camping.